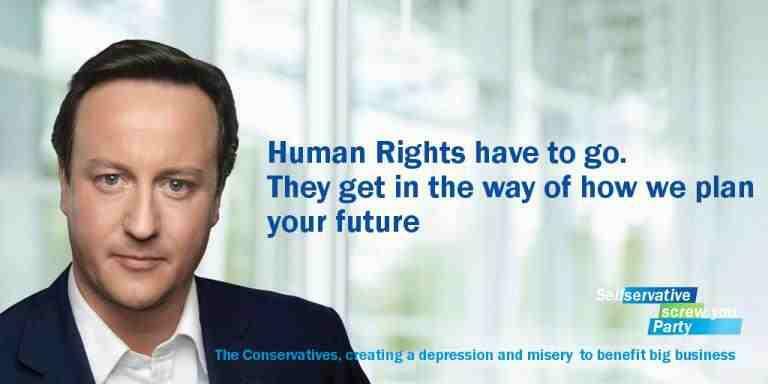 The UK Government have got it wrong about our Human Rights. The Joint Parliamentary Committee on Human Rights has conducted an inquiry into the UK Government’s implementation of Article 19 of the United Nations Convention on the Rights of Persons with Disabilities (UNCRPD) – the right to live independently and to be included in the community. The inquiry which began in 2011 has received evidence from over 300 witnesses. The inquiry has highlighted just how little awareness, understanding and employment of the Convention there is by the Tory-led Government. Very few of the witnesses made specific reference to the Convention in their presented evidence, despite the inquiry being conducted by the Parliamentary Human Rights Committee, with the terms of reference clearly framing the inquiry as being about Article 19 of the UNCRPD. The report is particularly critical of the Minister for Disabled People (Maria Miller, at the time) who told the Committee that the CRPD was “soft law”. The Committee criticised this as “indicative of an approach to the treaty which regards the rights it protects as being of less normative force than those contained in other human rights instruments.” (See para. 23 in the report, the link is at the foot of this article.) The Committee’s view is that the CRPD is hard law, not soft law. In other words, the Tory-led Coalition has quietly removed this part of the Equality Act. The budget of the Equality and Human Rights Commission (EHRC), which was established by the Labour Party when they were drafting this flagship policy, is being reduced by over 60%, its staffing cut by 72%, and its powers restricted by the Coalition. Provisions that are being repealed by the Enterprise and Regulatory Reform (ERR) Bill include the duty on public authorities to have due regard to the need to reduce socio-economic inequalities. Savage Legal Aid cuts from April 2013 have also contributed significantly to creating further barriers to ensuring Equal Rights law protect us, and the Tory-driven Legal Aid Bill also contravenes our right to a fair trial under Article 6(1) of the European Convention on Human Rights. This is not a coincidental multiple policy timeline, but rather a very coordinated political attack on potential legal challenges at a time when Tory-led severe and devastating multiple welfare and provision cuts have affected disabled people so disproportionately. The changes, which came into effect in April, will hit “the same group of disabled people over and over again”. The threats to the legal infrastructure make it all the more important to mobilise all disadvantaged groups around equality as a fundamental human right. The right to independent living does not exist as a free-standing right in UK law. Although it is protected and promoted to some extent by a matrix of rights, the Committee believes that this is not enough. It argues that the Government and other interested parties should immediately assess the need for, and feasibility of, legislation to establish independent living as a free-standing right. In addition, the Committee concludes that the UNCRPD is “hard law” and that the Government should fulfil their obligations under the Convention on that basis. people fear that the cumulative impact of these changes will force them out of their homes and local communities and into residential care. the Government has not conducted an Equality impact assessment of the cumulative impact of current “reforms” on disabled people. The Report urges them do so, and to report on the extent to which these “reforms “are enabling them and local authorities to comply with their obligations under the UNCRPD. The Committee states that the Government should make a commitment to Parliament that they will give due consideration to the articles of the Convention when making legislation. The UNCRPD did not have a significant role in the development of policy and legislation, as is required by the Convention. Furthermore, the Committee criticises changes to the duties of public authorities in England under the Equality Act 2010, which no longer require the production of equality impact assessments of changes in policy, nor the involvement of disabled people in developing policies which will affect them. The Committee also expresses a major concern over a growing incidence of hate crime against disabled people and urges the Government take action to foster respect for the rights and dignity of disabled people. Article 19 states that the Government must always ensure it “stops things getting worse.” This has NOT happened. The quality of so many sick and disabled people’s lives in this Country has been radically, significantly and DELIBERATELY reduced since the Tory-led Coalition took Office in 2010. This needs to change as a matter of urgency. The Government’s “reforms” have led to a terrible increase in deaths amongst sick and disabled people, and we have already seen a significant rise in suicides that are directly linked with the Tory-driven austerity measures. When we genuinely seek to improve the situation of the poorest and vulnerable, first of all we will need to spend time studying the privileged elite and their lifestyle choices of tax avoidance, their own economic lasciviousness and lack of capacity for personal and social responsibility. We need to pay attention to Government handouts (of our money) to banks, private businesses and the wealthy: we need to appraise the dependency and culture of entitlement that these sponsored acts have fostered, and of course special focus should be on the amoral decisions and anti-social actions of the feckless, scrounging wealthy, and with particularly careful, critical scrutiny of the Government responsible for policies that re-distribute and concentrate our wealth and their advantage and power, therefore creating social divisions, inequality and poverty, perpetuating and extending it. The Tory-led Coalition prefers to take money from the vulnerable, the sick and disabled, and hand it out to millionaires. We need to ask why our Government refuses to instigate or agree an inquiry into the substantial rise in deaths amongst sick and disabled people, as these deaths are so clearly a direct consequence of this Government’s policies. What kind of Government uses the media to scape-goat and stigmatise sick and disabled people, by lying and inventing statistics to “justify” the persecution of some of our most vulnerable citizens, and the withdrawal of their crucial lifelines and support? One that does not value those lives, or regard them as having an equal worth with others. Many thanks to Robert Livingstone for his outstanding art work. Outstanding find by the excellent Sue Jones reveals that a Parliamentary committee has condemned the government for circumventing the law to deprive disabled people of their “right to live independently and to be included in the community”. Please read and share widely. Cameron is akin to Hitler and Atos is akin to Action T4. The definition of madness is repeating the same mistakes and expecting a different result. Good article Sue. Just a small correction, it was the previous Minister “for” Disabled People, Maria Miller, who was called to task for describing the UNCRPD as “soft law”. Mind you, it’s easy to confuse them as they’re just as right wing and cynical about disabled people as each other. Sorry, now I’m confusing you with “Sue”! Hi Paul, lol No you’re not confusing me at all. Glad I’m not confusing you! Incidentally, in response to a Disability Wales campaign and following a co-productive process of engagement with disabled people and organisations, the Welsh Government will be publishing a Framework for Action on Independent Living in the autumn. There’s a long way to go but at least we’re taking steps in the right direction…although at present we’re having to lobby to get Independent Living included in the Welsh Gov’s Social Services & Wellbeing Bill, in line with the JCHR’s recommendations. Thankfully we have Ministers and Assembly Members who listen, even if they don’t always get everything right. Glad to hear Wales has much more responsive ministers than we do. Yes , I know what brain fog is like. Very good article. I might add that the convention isn’t actually legally binding but only meant as guidelines,.. despite the fact countries sign up to it. The convention is pretty useless in my personal view – it hold no REAL weight or power. Didn’t the camerons claim DLA for their son, before deciding the rest of us (without millions in the bank) don’t need it? Not sure if this is true, but if so he should have a public flogging! OMG, really? this is sick and sneaky, crafty, nasty, evil and just looking after No . 1 thenselves. As long s they have plenty muny in the bank, to live in luxury , they dont give a toss about us. we ar epeasnats to them, juts numbers, that work and keep the, whats left of the country going ,paying taxes for them to take. . Yes i agree with CJ June hes needs apublic flogging, there shud be an outcry on this . Most unfair. well we aint got any rights now, so I dont know why this Government are sayin this. they have already took it away. sickening justr think if themselves NO. 1… we are just peasants to them , we are nothing, they dont care about us anymore. Its all got worse, the country is overpopulated , we are all fallling off it. Now in 2015 we witness the war upon the under 25’s; Reduced right to Housing Benefit. No right to the fallacious, incoming ‘Living Wage’, this being qualified by Hancock saying that they don’t work hard enough with no recourse to evidence to support his position. Under 25 year old claimants already receive less for their claim than over 25 year old purely on the basis of age and the conditions placed upon them by claiming are possibly the most oppressive and controlling. How does this all agree with the Equality Acts protection from discrimination on the grounds of age? Alas there is no one to take up the legal argument. Whoever said Labour has no policies: Prepare to be embarrassed!